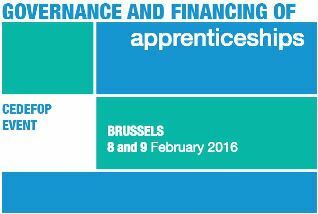 The objective of this event is to disseminate and debate the findings of Cedefop’s project on ‘Governance and financing of apprenticeships’ carried out in Italy, Latvia, Portugal, Spain and Sweden from November 2013 to June 2015. The project was designed as an action research with national stakeholders actively involved: representatives of governments, employers, employees, training providers and independent experts participated in a series of events to assess current apprenticeships/VET governance structures and financing arrangements in each country and discuss alternative scenarios to develop quality apprenticeships. reflect on the way forward: identify research gaps and countries’ needs for further Cedefop support in the areas of governance and financing of apprenticeships, and share ideas on potential tools for research and policy implementation. The event will bring together national stakeholders from five EU Member States that participated in the project and from other countries, as well as representatives of EU and international institutions, including the European Commission, European Training Foundation and International Labour Organisation.